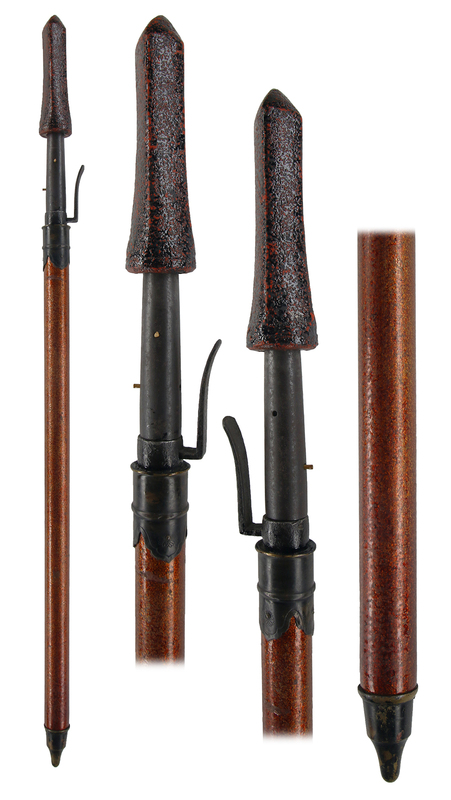 Whole Koshirae length : 93 cm or 36.61 inches. Whole Yari length : 22.5 cm or 0.88 inches. Blade length : 11.68 cm or 4.59 inches. Sori : 0.0 or 0 inches. Width at the hamachi : 2.51 cm or 0.98 inches. Kasane : 0.76 cm or 0.29 inches. Era : Late Edo period. Shape : The shape of Yari kooks Sasaho Yari and Fukuro Yari style. and visible to see the Jigane well. in preparation for sudden attack. Koshirae : Nashiji style nice Fukuro yari. an enemy sudden attack . of small traveling bucket(wagon) which is called Kago. in order to stop enemy's sword attack. Copyright © 2015 Aoi-Art All rights Reserved.